When I met Tammy Stellanova through a mutual friend , I had no idea that I’d be inspired to write about her for GeekMom. Over calzones and wine, the conversation turned to our work and eventually, Tammy mentioned her jewelry. 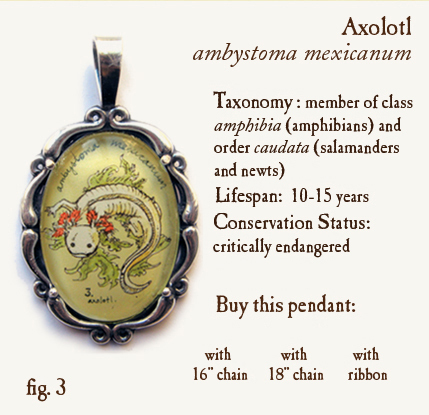 We laughed over the story about certain scientists geeking out over finding a piece of jewelry featuring their obscure obsession (an axolotl); once I’d seen Tammy’s ring and explored her website, I knew I had to share. Oh, Steampunk fans. These pieces, with illustrations reminiscent of the work of Victorian botanists, are going to have you yearning, I tell you. I’m partial to the Hawai’i wildlife series, in particular the rendering of the ‘ohi’a lehua blossom, but there are many images to choose from. Jonesing for a pendant featuring an Emperor nautilus? (Because who isn’t, really?) Tammy can hook you up. How about a European honeybee, an Ord’s kangaroo rat, or a strawberry poison frog? There are plenty of options to choose from, but Tammy does custom work, too – in case your particular natural obsession isn’t represented. Rendered in ink and watercolor, Tammy’s artwork features both animals and botanicals. She uses modern technology to reduce the size of her drawings, sealing each one permanently under glass for her pendants, rings, and even wine glass charms. Look for Tammy at the upcoming San Diego Comic Con, July 20-24, where you can check out her books, sea urchin t-shirts, and a large selection of jewelry. If you are a science geek and love jewelry, check out http://surlyramics.com/ which is made by SurlyAmy of Skepchick.org. (This isn’t meant to be spam, I have no financial interest in surlyramics.com).